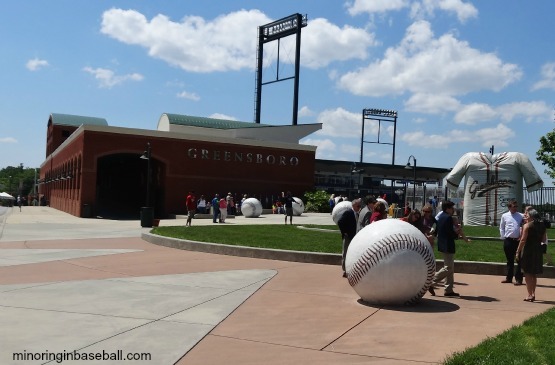 NewBridge Bank Park–Greensboro, NC: We had to leave the college game a little early to make sure we made it to Greensboro on time. It was well worth it, too, as NewBridge Bank Park has a beautiful facade, and it gave me a chance to get some nice pics outside the ballpark. We also wanted to be there when the gates opened so we had time to play catch on the field. It’s always a thrill to actually get out there where all of the action takes place! It was fun and relaxing to get out there and have a good game of catch. Also, with all of the travelling, it was good to be active and stretch our legs. After my impressive athletic display, we found our seats and got ready for the game to start. There wasn’t a huge crowd for a Sunday game, but the fact that it was Mother’s Day may have had a hand in that. Still a good crowd, though, and they really like their Grasshoppers! 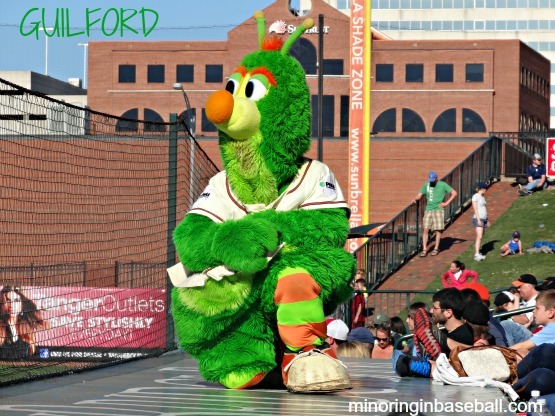 The mascot Guilford was active with the fans, and liked to hang out on the visitors dugout. He seemed to be really good with the kids in the crowd. 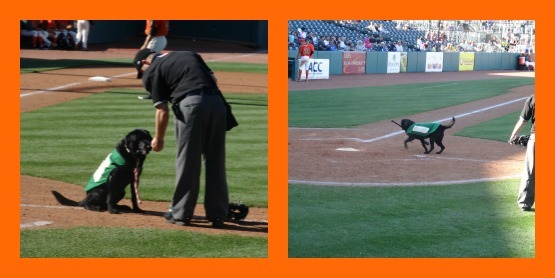 The really fun and unique aspect of the Greensboro experience, is that they have two dogs, Miss Babe Ruth and Lulu Gehrig who fetch the bats, and take baseballs to the umpires. Just one of the many things we’ll always remember about this trip! A Grasshoppers game is a must for any baseball fan who is in this area. With a beautiful ballpark, great fan base, and unique aspects of the club, no one can leave a game not satisfied! Playing catch on the field! 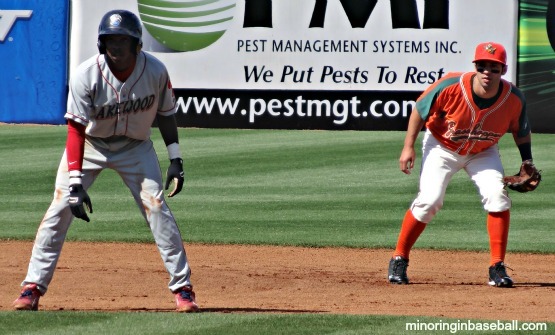 For the actual game itself, the Grasshoppers (Miami) hosted the Lakewood BlueClaws, a Phillies affiliate. Greensboro jumped out to a 1-0 lead in the first inning, but unfortunately, that was the only scoring for the home team. 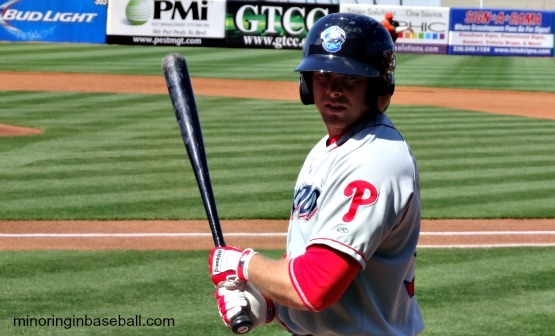 The BlueClaws would score three runs in the fourth, and two in the seventh for the win. We did see some solid pitching for both teams, though. 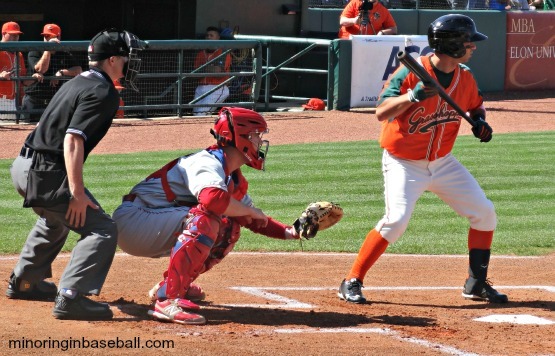 Anthony Gomez, Matt Juengel, and Cody Keefer each had two hits for the home town ‘Hoppers. 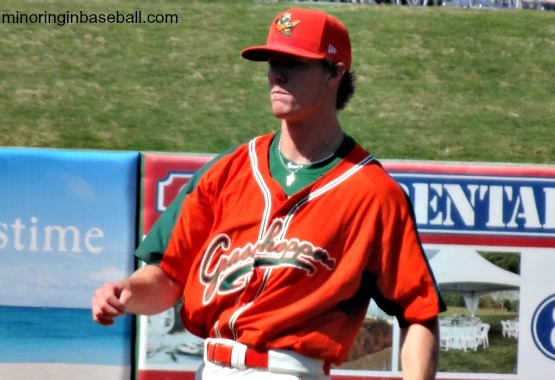 Austin Brice looked solid on the hill, but still took the loss. Final score: Grasshoppers 1, BlueClaws 5. Glad you had a great time! Sorry it didn’t work out for Jordan or me to make it put to the park and join you! Greg-we certainly did have a great time! I understand that you guys couldn’t make it, and know that family comes first. I would love to make down your way again sometime! 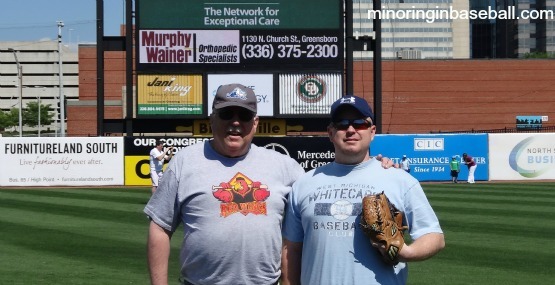 It’s a shame Jordan and I weren’t able to welcome Mike to Greensboro when he was visiting a few weeks ago, but he wrote about it on his Miniring in Baseball blog. 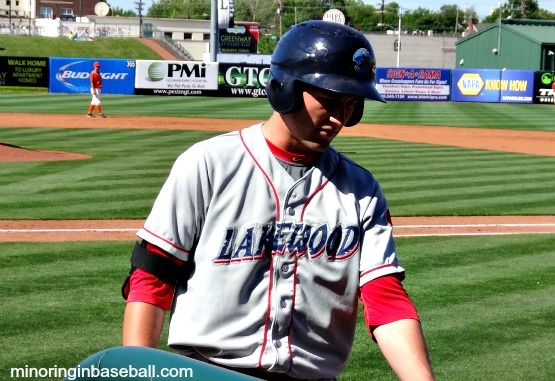 Enjoy his thoughts on the park and the game, and check out the great pictures he got! 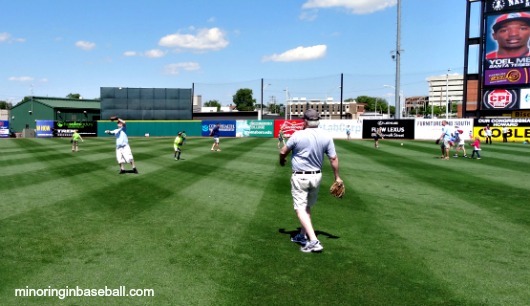 Also, check out his blog for stories about the othe ballparks he visited while in the area. Thanks for coming out, Mike! Glad you enjoyed your visit. All three run the bases (to get treats placed there quickly at the end of the game). All three relieve themselves at some point after the game on the field, which often provides the greatest crowd response. Don-thanks for clearing that up! That is such a fun and unique aspect of the Grasshoppers games. Shannon-it was a fun game and we enjoyed more beautiful weather.